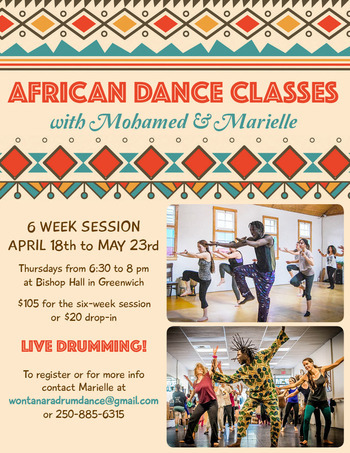 Come dance with an accomplished Guinean dancer, Mohamed Duranteau and his wife Marielle Duranteau. The dynamic duo has been teaching Guinean dance together and performing for audiences of all ages for the last 12 years, starting in Victoria, BC, then in Montreal, QC and now in Halifax, NS. They are very eager to share their love for African music and dance with the Halifax and Wolfville communities. Mohamed and Marielle offer you an immersion and a rewarding experience in the culture of Guinea. In these classes, you can dive into the rhythm and explore the subtleties of every dance move. Each class begins with an invigorating warm up and continues with dance theory followed by the repetition of each movement in a diagonal line across the dance floor. Each class is accompanied by an excellent and experienced team of percussionists. Classes are open at all levels. ~ Learn dancers who have several years of experience in teaching dance for all levels.